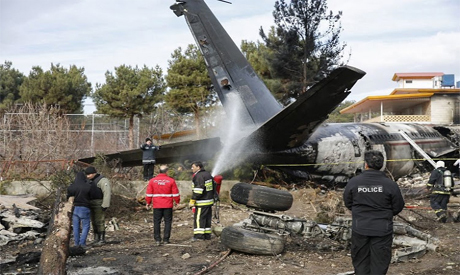 A Boeing 707 military cargo plane crashed in bad weather on Monday west of the Iranian capital, killing 15 out of the 16 people on board, the Iranian army said. "A Boeing cargo 707 place carrying meat from Bishkek in Kyrgyzstan had an emergency landing at Fath airport today ... the flight engineer has been dispatched to the hospital," the army said. "It exited the runway during the landing and caught fire after hitting the wall at the end of the runway," the army. The army's statement came after some confusion over who owned the plane. Earlier on Monday, a spokesman for Iran's civil aviation told had told state TV that the plane belonged to Kyrgyzstan, while a spokeswoman for Kyrgyzstan's Manas airport said the plane belonged to Iran's Payam Air.